These colorful addition task cards will be perfect for your students as they continue to practice and memorize their addition facts! 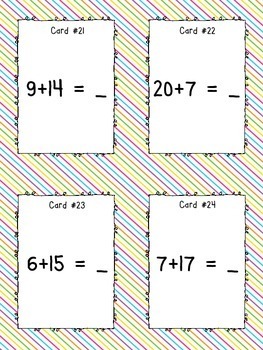 These task cards meet second grade Common Core standards for Operations & Algebraic Thinking. This packet includes 28 single and double digit addition fact cards 0-20) AND 12 single and double digit addition fact word / story problems. 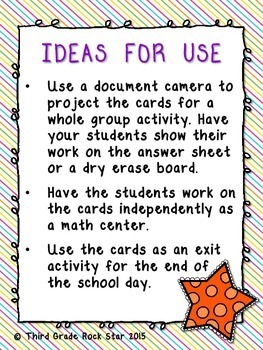 The packet also includes a double-sided printable answer sheet, an answer key, and ideas for use. Need some easier facts? 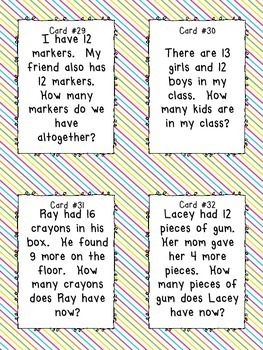 Check out my Addition Level 1 Task Cards !